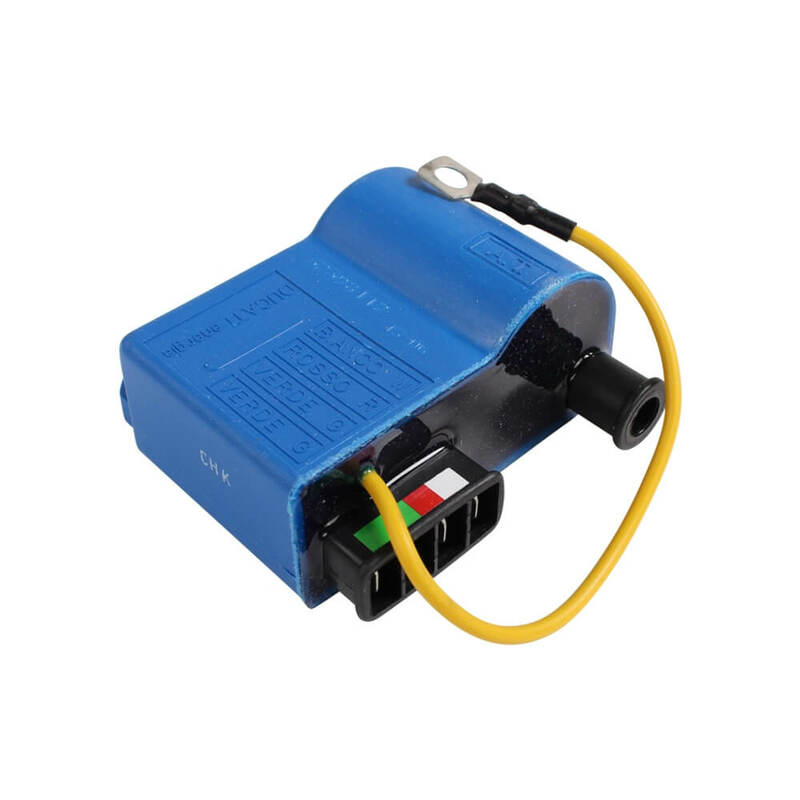 External ignition coil (also known as H.T. coil or CDI box). Fits VSX, VLX (with electronic ignition), and very late model (1977) Rally 200. If you have a Rally, please check your CDI and see if it looks like this one. A typical CDI module consists of a small transformer, a charging circuit, a triggering circuit and a main capacitor. First, the system voltage is raised up to 400-600 Volts by a transformer inside the CDI module. Then, the electric current flows to the charging circuit and charges the capacitor. The rectifier inside the charging circuit prevents capacitor discharge before the ignition point. When the triggering circuit receives triggering signals, the triggering circuit stops the operation of the charging circuit, allowing the capacitor to discharge its output rapidly to the low inductance ignition coil, which increases the 400-600 V capacitor discharge to up to 40 kV at the secondary winding at the spark plug. When there's no triggering signal, the charging circuit is reconnected to charge back the capacitor. Please check your CDI module with the pictures on each item page carefully prior to ordering.